In the Bag | Features | Kids VT - small people, big ideas! The journey back to school starts with a fresh set of supplies — notebooks, pencils and, of course, a book-bag. 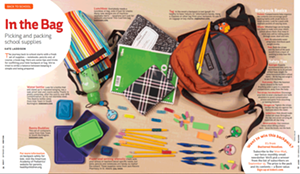 Here are some tips and tricks for outfitting your kids' backpack of bag. We've tried to strike a balance between keeping it simple and being prepared. Click the image at right to view the magazine spread from Kids VT.
Too hard to read? Click here for a zoomable verion (requires Flash). Click the image to view the spread.